Whether you are seeking a ski vacation in the winter whitewater rafting in the spring playing golf in the summer or enjoying the aspen leaves during our fall foliage you will feel very at home with all that Gold Point has to offer complete with hot tubs in each building. 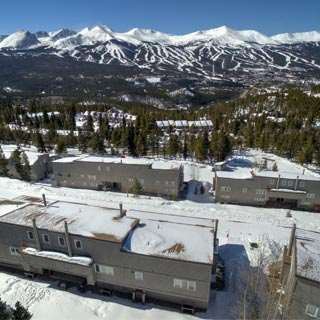 Gold Point Resort boasts unparalleled breathtaking views of downtown Breckenridge the Breckenridge Ski Resort and the entire Ten Mile Range from each of its spacious condominiums. Guests have up to 31 days prior to arrival to cancel or downgrade and receive a refund less a 100USD booking fee. At 30 days prior to arrival the reservation is completely non-refundable unless travel insurance has been previously purchased. Exceptions may apply - Please see rate rules. Breckenridge has three Jack Nicklaus signature nine-hole championship courses. The BEAR the BEAVER and the ELK play at 9300 Plus feet in elevation and each nine offers amazing mountain views. Breckenridge is made up of 5 distinct peaks with terrain ranging from mellow rolling learning greens to majestic high alpine chutes and bowls. It is a mountain of possibilities that enable you to discover nature through fun in ways you d never imagined - where the air is pure and charged and life-long bonds are forged as deep as the mountain is high. A stately 750-seat performance venue is located on the banks of the Blue River in downtown Breckenridge. It hosts the summer repertoires of the Breckenridge Music Festival Orchestra and National Repertory Orchestra and much more. A 150-seat theater offering digital picture and sound screens first-run commercial titles as well as classic independent and art house films. The Stephen C. West Ice Arena offers ice skating hockey and games for the whole family. Public skating and hockey sessions are generally offered daily. Breckenridge Creative Arts supports and serves artists creatives cultural enthusiasts tourists and the community by providing a year-round schedule of performances exhibitions screenings classes workshops and other engagement opportunities. As the largest historic district in Colorado Breck past is full of stories legends and characters. What started as a gold-rush base camp in the 1850s is now a bustling town that mixes western hospitality with Victorian architecture.